Empire actor Jussie Smollett leaves Cook County jail after posting bond on Thursday. 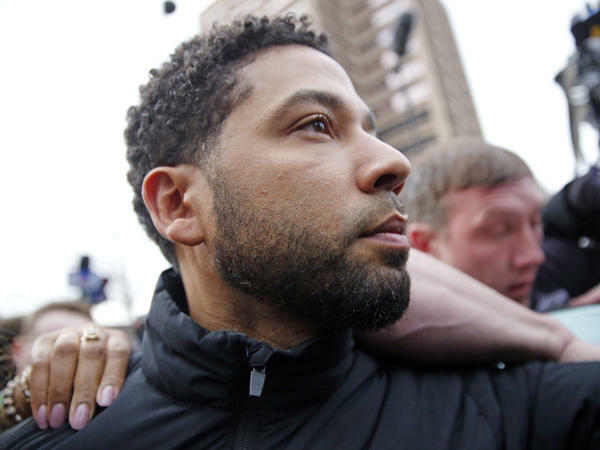 Today, I have two names for those tempted to gloat, despair, or be ashamed because of Jussie Smollett, the actor now accused of orchestrating a fake bias crime against himself. Those two names are Charles Stuart and Susan Smith. For those who don't remember: In October 1989, Charles Stuart sent Boston police on a tear looking for the black man he claimed forced his way into his car — after a childbirth class no less — and then shot and wounded him and killed his pregnant wife. The governor and mayor attended Mrs. Stuart's funeral. Police began stopping and searching men in predominantly black neighborhoods; Stuart went so far as to pick a man out of a police lineup. It was a national story, highlighting what was described as a spate of violent crimes in Boston that year. Except, there was no robbery, there was no black man in a sweatsuit with red stripes. Stuart orchestrated the whole thing — it was never clear why — but when police were on the verge of arresting him due to a tip provided by a family member, Stuart took his own life. Five years later — October 1994 — in Union, S.C., Susan Smith took her two small children to the babysitter, went to work, picked them up, and then drove to a lake where she let her car roll into the water with the boys still strapped inside. She then tearfully appeared before local and national television outlets, claiming that a young black man had ordered her out of the car and drove away with her boys. It took nine days before she revealed the truth; authorities said she blamed the boys for disrupting her love life after a boyfriend broke things off. Smith was convicted and remains in prison. But, while a lot was said about why Smith did it — the trial revealed she'd experienced terrible childhood abuse and trauma — little was ever said about the effect her lies may have had on any young black men living in that town. So now here comes Smollett to, allegedly, flip that script. Instead of the scary black men terrorizing white suburbanites like the Stuarts, or Smith, he invokes scary MAGA hat wearers spewing hatred because he is black and openly gay. As you can imagine, some in the conservative media and Twitterverse can barely contain their glee at this turn of events. But they should try. On the very same day Smollett was arrested and charged with filing a false police report, federal prosecutors revealed that a white Coast Guard officer was stockpiling an arsenal of weapons and had created a list of journalists and Democratic politicians he presumably hoped to target. Prosecutors allege he was planning mass murder, and perhaps that race war so pathetically, eagerly sought by white supremacists. And as sick and sad as that sounds, if true, it's by no means the only time we've heard that story, just the latest, and probably won't be the last. Can I Just Tell You: The moral of the story for me is what it always is and always will be, the truth can hurt but the truth WILL come out eventually and it will always set you free. But for that to happen there have to be truth tellers and truth seekers. In the case of Stuart and Smith, people close to them came forward with relevant facts. But the investigators had to be willing to receive and incorporate those facts. The cases of Smollett and the accused Coast Guard officer Christopher Hasson, continue to unfold. But whatever uncomfortable facts emerge — about how far some will go for attention or about white supremacist leanings among those sworn to protect and defend us — about alcohol, drugs, or perhaps unresolved childhood trauma — we have to be prepared to face those facts. We have to because the world is complicated. We have to because, as Maya Angelou said, hurt people will hurt people. We have to because our lives depend on it. We have to because we are, after all, brave. And we can handle the truth. Finally today, I have two names for those tempted to gloat, despair or be ashamed because of Jussie Smollett, the actor now accused of orchestrating a fake bias crime against himself. Those two names are Charles Stuart and Susan Smith. For those who don't remember, in October, 1989, Charles Stuart sent Boston police on a tear looking for the black man he claimed forced his way into his car - after a childbirth class, no less - and then shot and wounded him and killed his pregnant wife. The governor and the mayor attended Mrs. Stuart's funeral. Police began stopping and searching men in predominantly black neighborhoods. Stuart went so far as to pick a man out of a police lineup. It was a national story highlighting what was described as a spate of violent crimes in Boston that year. Except there was no robbery. There was no black man in a sweatsuit with red stripes. Stuart orchestrated the whole thing. It was never clear why. But when police were on the verge of arresting him due to a tip provided by a family member, Stuart took his own life. Five years later, October, 1994 in Union, S.C., Susan Smith took her two small children to the babysitter, went to work, picked them up then drove to a lake, where she let her car roll into the water with the boys still strapped inside. She then tearfully appeared before local and national television outlets claiming that a young black man had ordered her out of the car and drove away with her boys. It took nine days before she revealed the truth. Authorities said she blamed the boys for disrupting her love life after a boyfriend broke things off. Smith was convicted and remains in prison. But while a lot was said about why Smith did it, the trial revealed she'd experienced terrible childhood abuse and trauma. Little was ever said about the effect her lies may have had on any young black men living in that town. So now here comes Smollett to allegedly flip that script. Instead of the scary black men terrorizing white suburbanites like the Stuarts or Smith, he invokes scary MAGA hat-wearers spewing hatred because he is black and openly gay. As you can imagine, some in the conservative media and Twitter-verse can barely contain their glee at this turn of events. But they should try. On the very same day Smollett, who was arrested and charged with filing a false police report, federal prosecutors reveal that a white Coast Guard officer was stockpiling an arsenal of weapons and had created a list of journalists and Democratic politicians he presumably hoped to target. Prosecutors allege he was planning mass murder and perhaps that race war so pathetically, eagerly sought by white supremacists. And, as sick and sad as that sounds, if true, it's by no means the only time we've heard that story - just the latest and probably not the last. Can I just tell you? The moral of the story for me is what it always is and always will be. The truth can hurt, but the truth will come out eventually, and it will always set you free. But for that to happen, there have to be truth tellers and truth seekers. In the case of Stuart and Smith, people close to them came forward with relevant facts. But the investigators had to be willing to receive and incorporate those facts. The cases of Smollett and the accused Coast Guard officer, Christopher Hasson, continue to unfold. But whatever uncomfortable facts emerge about how far some will go for attention or about white supremacist leanings among those sworn to protect and defend us, about alcohol, drugs or perhaps unresolved childhood trauma, we have to be prepared to face those facts. We have to because the world is complicated. We have to because, as Maya Angelou said, hurt people will hurt people. We have to because our lives depend on it. We have to because we are, after all, brave. And we can handle the truth. Transcript provided by NPR, Copyright NPR.